There really is no reason one would buy a gold leaf skateboard other than to show off that you could buy a gold leaf skateboard. 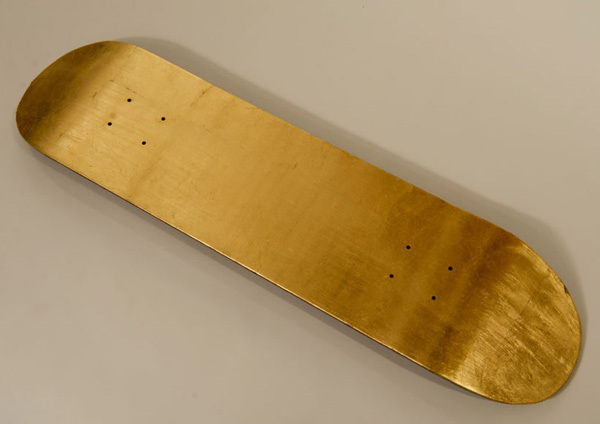 Having said that, Miya Ando, the designer behind the gold covered skate deck, has engineering a board from steel and covered it in 24K gold leaf one side. You may win bragging rights from some of your adrenaline-junkie friends, but the depreciation value of the board is worse than buying a Yugo off the line. Beyond this luxury deck, Ando is known for her minimalistic metalwork and has seen her work featured in numerous galleries in Los Angeles, New York City, Paris and Tokyo. I will be seriously pleased together with your writing skills and also with the format on your website. Is it a paid for theme or did you colorize it for you all by yourself? Either way continue the wonderful excellent writing, that it is unusual to find out an excellent site just like this these days..